It was more uncomfortable than it should have been, but Raith Rovers got the required three points at bottom of the table Stenhousemuir. When Callum Crane put the away side 2-0 up early in the second half with his first goal for the club, it seemed Rovers were on their way to a fuss-free victory. However, Stenny had other ideas and after pulling one back through Mark McGuigan, there were some anxious moments for the Kirkcaldy side as they clung on to their lead. It required a special strike from Daniel Armstrong with two minutes remaining - his second goal of the game in only his second appearance for the club - to settle nerves and ensure no repeat of the recent slip-ups at Forfar and East Fife. The former Wolves winger looks to be a real find for Rovers boss John McGlynn. "He's a spark - a livewire who makes things happen," he said. "He was in the right position to score the first goal with a header and I've seen him do in training what he did for the third goal. "He's got a really good left foot - it's like a wand. Sometimes you get a cross-come-shot, but I think he meant it, because he's good enough to do that." On the game itself, McGlynn added: "Stenhousemuir may be at the bottom of the table but they made it very difficult. "We started really well and deservedly went in front, but we tend to do things the hard way, and even after getting the second goal, we make things difficult by not defending a simple ball over the top, which I felt we should have been able to deal with. "Then we have to really dig in, which we did, then Dan Armstrong's produced a bit of magic with his second goal, and we could see out the last few minutes with a wee bit more comfort." Raith were again missing several players through injury - six in total - while Nat Wedderburn sat out due to suspension. With limited midfield options, McGlynn opted to move left back Crane into the middle of the park alongside Ross Matthews - a move which proved a masterstroke as not only did the 22-year-old find the net, he acquitted himself particularly well in an unfamiliar role. It meant their was a start for teenage defender Jamie Watson, who played the first half at right back, before swapping with Euan Murray at half-time, and moving over to left back, as McGlynn looked to protect the youngster from Stenny's key threats. Armstrong gave a hint of his danger when he beat two men with ease in the eighth minute but his cut-back found no takers. The winger had better luck four minutes later when Kevin Nisbet found acres of space down the left to pick out a cross, and as the ball deflected away from the goalkeeper, Armstrong reacted sharply to nod the ball over the line from six yards. Raith were looking strong and they continued to attack throughout the opening half hour, with Stenny struggling to cope with the tempo set by the full-timers. Kyle Benedictus was guilty of missing the best chance for a 2-0 lead, blasting over the bar from close range after a well-worked corner routine. Rovers then had a rocky spell in the five minutes before half-time, and the home side had three quick attempts on goal, none of which hit the target. 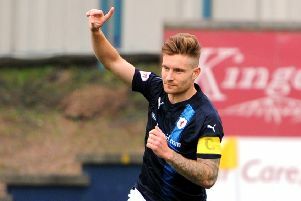 The best opening fell to Ross County loanee Harry Paton after Rovers defence failed to properly clear their lines, but with time to size up the goal from 18 yards, he blasted his effort too high. Rovers were glad of the half-time whistle to end the spell of home pressure, and McGlynn's team talk seemed to get the players back on track, with Armstrong forcing Graeme Smith to push a 20-yard drive past the post shortly after the restart. The second goal was only delayed until the 57th minute when Liam Buchanan did particularly well to break the offside trap, before cutting the ball back for the inrushing Crane to measure a low side-foot effort through a crowd of bodies into the net from 16 yards. Perhaps thinking they were home and dry, Raith seemed to lose concentration at the back as Stenny proceeded to create chance after chance, through nothing more than simple balls forward not being dealt with by the Raith centre-halves. On one such occasion, both Davidson and Benedictus were painfully slow to react to a punt forward allowing McGuigan to race between them, only for Robbie Thomson to come to the rescue with a point-blank block. Several warnings went unheeded and Rovers paid the price on 67 minutes when Davidson was caught out of position, allowing McGuigan another free run on goal and this time he coolly lobbed Thomson to reduce the arrears. Having defended robustly throughout the first half, Rovers' sudden lethargy in defence was alarming and the team was now under pressure from a Stenny side working hard for caretaker manager Colin McMenamim. At the other end, Nisbet came close to restoring the two-goal lead as he broke into the box only for Smith to make a good block at close quarters. Buchanan had put in a great shift, and was replaced by Lewis Milne, then Rovers had a let-off when home replacement Kevin O'Hara was unmarked at the back post, but his ball back across goal was nodded wide by fellow sub Bobby Vaughan. Rovers were bracing themselves for a fraught final few minutes when Crane embarked on a run down the left, and his cross was touched off the foot of Nisbet by a defender with the goal at his mercy. A chance to relieve the pressure appeared to have passed, but from the corner, Rovers worked it short to Armstrong at the corner of the box and he arrowed a pinpoint finish over the outstretched arms of Smith into the opposite top corner to seal the win. Some of the frailties which have allowed Arbroath to open up a 10-point gap were still on display, but there were also lessons learned from the two previous away games which saw a half-time lead turn into defeat. This time, Raith got the job done.